May 1, 2018 Biafrans had relentlessly fought to the point of no retreat no surrender, the remaining 5% to restore her nation’s heritage, dignity as the final stage-frightened Nigeria government to organize a referendum for Biafrans to determine their fate or debate on the matter arisen. The term referendum is not new in modern comparative politics, is thought to have migrated from Swiss Canton of Graubuden as early as 16th Century. The name in a quote generally has a similar meaning in contemporary usage with two typologies such as a mandatory referendum, this type of referendum prescribed by law whereas, the second one is a voluntary referendum, is initiated by the legislature, government and citizens which Biafrans stood as legitimate right for their quest to restore Biafra. Many countries of the world had their referendum peacefully as a democratic way of determining certain proposal without confrontation or military crackdown on unarms innocent citizens asking for their universal right that supersedes that of Nigeria constitution. Certainly, criticism is inevitable, pathetic most of them were dictators such as Adolf Hitler, Ferdinand Marcos, Park Chug-hee, Francisco Franco and Nigeria president, Muhammadu Buhari. Not very surprisingly, they strategically trying to pursue political goals to the detriment of the collective will of electorates. 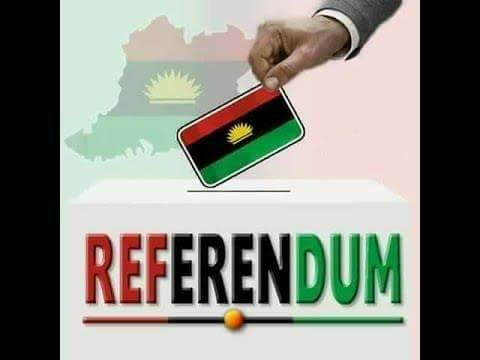 Every Biafran born with Biafra blood is curious to canvass their votes for BIAEXIT on the forthcoming exercise, Nigeria on the other hand, is afraid to let go because it may mark the obliteration of her existence on the world map as they conspired with their British slave master to remove both Biafra history and her map, but not afraid to organize 2019 general election. A call for a referendum is not a call for war. Unlike Nigeria, fighting, by all means, to keep irreconcilable unity in diversity one with guns and bullets against international law, egalitarianism ought to have been a watchdog of United Nations, unfortunately, deviating from her assign responsibilities to unprecedented indices. That which is good for Whites is also good for Blacks. Britain opts out from European Union, without a record of British shoot to dead, Catalonia is not an exception even Turkey changed from parliamentary system of government to presidential system through the Yes or No ballot exercise (referendum). Why is Biafra different? No doubt Nigeria is backward to assimilate modern comparative politics, the word referendum sounds strange for them to digest the theme and its functionalities. Freedom is never a crime in anywhere in the world, records of Biafrans shoot to dead on several occasions with little or no provocation despite all this, they never reciprocate rather remain peaceful. Currently, they are at White House, Washington DC, agitating for their voice to be heard by the world body. Arm struggle might not be the best solution for Nigeria, other countries tried to subdued freedom fighters, fighting a just war but failed, Yugoslavia did all she could at the end Kosovo, Croatia, and Bosnia seceded from her through combat. 1985-2005 South Sudan war of independent from Sudan is still fresh in the mind of any student of history. The best option is left for Buhari’s led government to use his tongue and count his teeth, thinking otherwise might lead Biafrans into the proliferation of arms and it might not be at the interest of both sides. Both Russia and Yugoslavia economy are still viable irrespective of many nations seceded from them, it takes only hard work for any nation to compete with others in global politics than depending on only one source of income and neglected other untapped sources that will make impacts on nation’s socio-political economy. A word they said is enough for the wise, any nation that is incapable of learning from her past mistakes and misfortunes is bound to repeat the same. 1967-1970 Biafra war came and gone, Biafrans of this generation are more intelligent, strong and wise to fight till their quest is fulfilled. Buhari is close to his grave, Nigerians must not allow him to create political dichotomy or hatred that will lead the two neighboring nations not to have good diplomatic relations. Only the wise can make use their brain, can Nigeria see the bold handwriting written on the wall?